Stay somewhere memorable – Scandinavia is increasingly known as a home to unusual holiday destinations, especially cool and quirky hotels, from minimalist structures to eco-friendly retreats, abandoned schooners and icy hotels that vanish with the spring thaw. 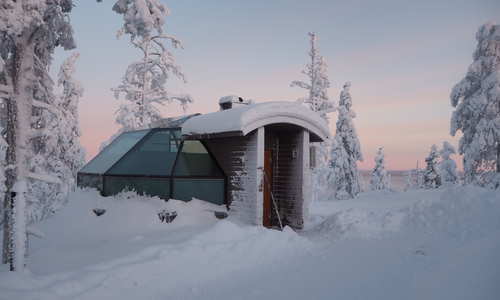 There is no shortage of unusual places to stay in Scandi. Relying on age-old insulation concepts dating back to arctic explorers and hardy indigenes, the innovative ice hotels of Sweden, Norway and Finland are rebuilt year on year for winter travellers. Guests stay on mattresses embedded in ice surrounded by frozen sculptures and reliefs set aglow by ethereal lighting. Sip cocktails from ice glasses after a day’s spent dogsledding, ice fishing or on a snowmobile. Then, head back out for a chance to spot the spectacular Northern Lights. Back in the rooms, while the temperatures dip below zero, adventurers are kept warm with thermal sleeping bags and thick reindeer fur. However, you don’t have to get cold to stay somewhere unique, especially if you're looking at travelling to Scandinavia in the summer. 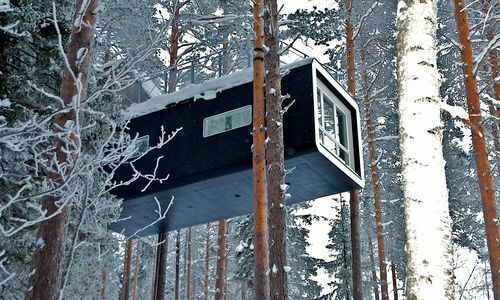 Perhaps look to the evergreen canopies of Sweden where innovative treehouses are strung at canopy level. Choose between everything from mirrored cubes and domed UFOs to wooden bird nests and a fully formed cabin. For something more grounded, look to the Ship in the Ice in Svalbard whose landlocked rigging and elegant masts are the tallest man-made structure for miles. The only accommodation of its kind in the world, its welcoming low-ceilinged cocoon is reached by dogsled or snowmobile. Back in mainland Europe, Sweden’s Luleå Archipelago is home to the twinkling fires of the Aurora Safari Camp. Set far away from civilisation, it’s not only a locavore’s delight but an African-style camp free from artificial light making for stunning views of the Northern Lights. Take the crossing less travelled with a flight to the Faroe Islands. Here, grass-roofed buildings – possibly including your hotel – stand in a banked salute to its scenic coast. Drive shore-hugging roads and hit the waters on island cruises to spot nesting puffins and soaring sea eagles. Alternatively, head to Svalbard for a polar adventure. Equidistant between the North Pole and the Norwegian coast, you’ll strike out on a snowmobile across glaciers to spot polar bears and stay in unique basecamps along the way, including a converted World War Two era telecommunications outpost, complete with a gigantic satellite dish. Having launched the careers of many a rally driver, Norway is the perfect place for an ice driving experience. Stay in a four star resort – complete with gym, swimming pool and spa – before hitting the ice under the expert tutelage of a professional instructor. For a classic and beloved activity holiday, look into a Northern Lights safari to witness night skies set aglow under dancing greens and raking reds.